We are pleased to announce the publication of David Edmonds’ Philosophers Take on the World, an edited collection of short essays, many of which are by our bloggers. Every day the news shows us provoking stories about what’s going on in the world, about events which raise moral questions and problems. 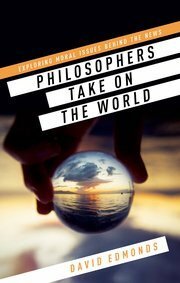 In Philosophers Take On the World a team of philosophers get to grips with a variety of these controversial issues, from the amusing to the shocking, in short, engaging, often controversial pieces. Covering topics from guns to abortion, the morality of drinking alone, hating a sports team, and being rude to cold callers, the essays will make you think again about the judgements we make on a daily basis and the ways in which we choose to conduct our lives.